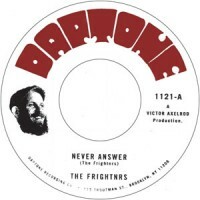 Brand new but vintage sounding rocksteady niceness here from The Frightnrs, originally self released in 2012 and now reissues on Daptone Records. One of the first songs that found bassist Preet Patel in the proverbial driver's seat, the tune began as a instrumental demo with only a chorus melody and a strong UK lovers rock vibe. Once Preet played it for the rest of the group the tune quickly came to life with the addition of Dan Klein's sincere, soulful vocal melody that pays homage to a long-time personal hero of the Frightnrs, the legendary Sugar Minot. It sees the band blend the lovers touch, mixed with that gritty Brooklyn & Queens rocksteady approach, with their sound paying homage to the original roots of reggae in painfully authentic style. The band aptly construct highly inventive dubs too, showcased here with "Questions" - which could literally have been plucked straight from Tubby's studio, in particularly the Brad Osborn / Aggrovators set "Reggae Stones Dub". A must have for any reggae fan!